DreamOrbit, an innovation driven software product engineering company, has won the prestigious Deloitte Technology Fast50 India Award. Company providing cutting-edge technology consulting and solutions to the largely unorganized transportation sector. The award ranks the 50 fastest growing technology companies in India, based on percentage revenue growth over three years. 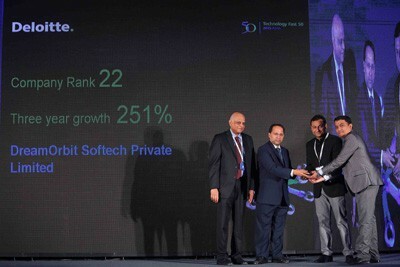 DreamOrbit wins the Deloitte Tech Fast50 India 2015 award 0 out of 5 based on 0 ratings. 0 user reviews.